When Colorado’s Water Plan set a statewide stream management planning goal, the state began to provide tools for planning. Is it working? In 2015, Colorado set a goal to better understand and protect the environmental and recreational assets of the state’s rivers and streams. The objective: to cover 80 percent of locally prioritized rivers with stream management plans by 2030. This goal was written into Colorado’s Water Plan, which draws a roadmap for the state to assess and address water needs into the future. By including stream management planning, the water plan asks Coloradans to account for more than just consumptive water needs. To date, no official list of priority streams exists. That’s because the goal aims to put prioritization in the hands of the stakeholders, says Becky Mitchell, director of the Colorado Water Conservation Board (CWCB). Stream management planning only makes sense where local users and interest groups buy into the process, and it’s therefore important that stakeholders set objectives for themselves. While there’s no precise way to assess progress toward an undefined statewide count of priority segments, many regional bodies, particularly the nine roundtables that represent Colorado’s major river basins across the state, are getting to work prioritizing and planning. Some local groups have begun formal processes to determine where the most pressing needs lie. For others, the in-progress or completed plans are de-facto priorities. From the state’s view, the basin roundtables, watershed groups, and others have taken major steps, both in terms of assessing priorities and the planning work itself, Mitchell says. With at least 16 plans underway or completed across the state, according to the CWCB’s count, the scope of prioritization and progress toward planning varies from basin to basin and watershed to watershed. For the Upper Gunnison Basin, the priority is clear: to cover the entire basin with an integrated watershed management plan. “In our case, we felt that we should really apply it to all streams within our basin,” says Frank Kugel, general manager of the Upper Gunnison River Water Conservancy District. The district is divided into eight sub-basins, and work is underway on needs assessments for three of them, with plans to complete all eight by 2021. Other efforts are so fresh that stakeholders haven’t yet determined who will be involved, or how they’ll prioritize streams. In the Yampa River Basin, the roundtable launched a scoping process in February to determine priorities. Over the coming months, the roundtable will engage stakeholders to determine if and where stream management planning makes sense and has local support. “I honestly don’t know if what we will learn will equate to a basin-wide integrated water management plan, or if it will end up being targeted stream segments that are ripe for an integrated water management plan,” says roundtable chair Jackie Brown, who works as the natural resource policy advisor for Tri-State Generation and Transmission Association. One thing is clear, the roundtable has already concluded that stream management plans will only make sense for the Yampa Basin if they also consider consumptive water demand, as is being done in the Upper Gunnison Basin. Not all areas of the state are taking up stream management planning as enthusiastically. While the uptake has been quick in many parts of the West Slope, planning efforts in eastern Colorado are rarer. As of June 2018, while planning and assessment efforts were in progress or complete on at least four discrete segments of the South Platte and Republican rivers, no basin east of the Continental Divide could boast a concerted approach to prioritization. 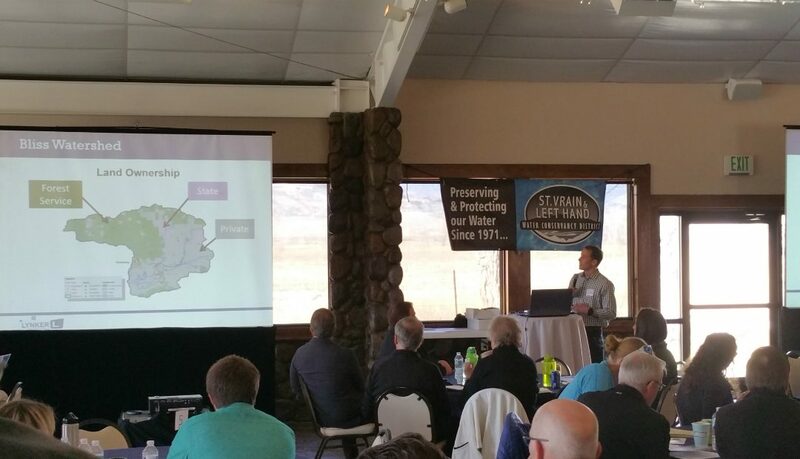 Joe Frank, a previous chair of the South Platte Basin Roundtable, says that while the roundtable is supportive of stream management planning, it hasn’t set out to formally consider where priorities lie and how to get plans underway in those areas. Not only are there more people recreating, but there’s generally more water on the West Slope—perhaps the amount of available water, in addition to how it contributes to a region’s economy, makes stream management planning more or less of a priority. “For some basins on the West Slope, their greatest future water need is for the environment and recreation,” Cronin says. To encourage planning and prioritization across the state, and to meet the water plan goal, the CWCB has made new funding and tools available for stream management planning. Up to $5 million was allocated for projects in 2017, with another $2 million approved through the CWCB’s 2018 Projects Bill, money that can be used for local prioritization projects and stream management plans. New tools can also streamline the planning process. The CWCB is currently updating the Statewide Water Supply Initiative (SWSI) with new tools and data on environmental and recreational values. As part of this update, consultants at CDM Smith are creating a flow tool, which will examine environmental and recreational impacts from different water supply and demand conditions across the state. The tool will allow water managers to identify gaps between water availability and potential flow needs based on environmental and recreational data, both under current conditions and potential future conditions. The SWSI update will also include major enhancements to the Environment and Recreation Database, previously called the Nonconsumptive Needs Assessment Database, maintained through CWCB. The database serves to organize and make available statewide information on environmental and recreational water values, along with projects that protect or enhance them. The updated version will integrate data from completed stream management plans and those under development and will include a map to make the data easier to locate. Work on the update is ongoing, with new tools expected later this year and a final report anticipated in June 2019.